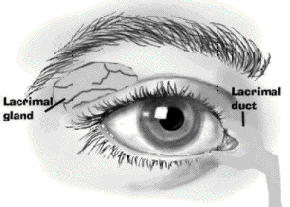 that can harden and plug the lacrimal duct. massaging the tear duct along the side of the eye and down the nose. usually a painless procedure and can be performed in the doctor's office. the eye under the eye brow. and down the side of the nose.